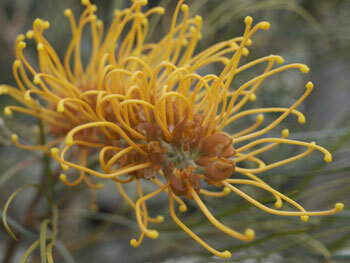 You are currently browsing the tag archive for the ‘flowering trees’ tag. 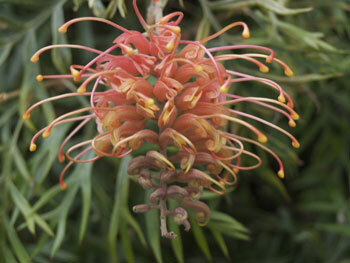 Recently we drove into Railway Road Sydenham & were amazed as a blaze of red flowers came into vision. 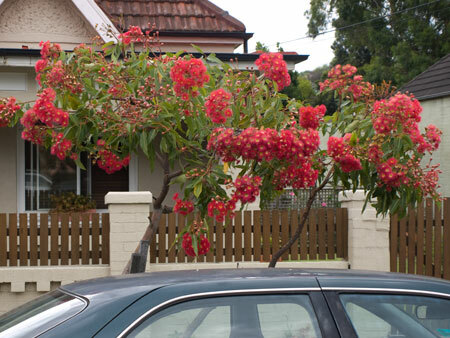 Marrickville Council has planted Red Flowering Gums along the street & they look fantastic. It’s such an unusual thing in this LGA to see bright flowering trees. 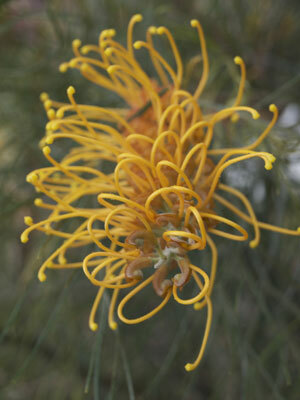 Council has also planted this species of tree on Livingstone Road outside Frazer Park & although these trees are a quarter of the size of the ones in Railway Road, they are still flowering. 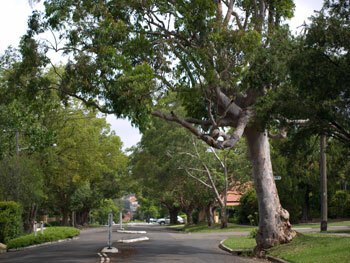 Well done Marrickville Council. I know I am not alone in liking these trees. One of the residents in Railway Road expressed approval while I was photographing them. 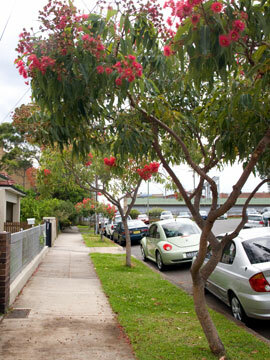 Metropolitan Road Enmore also has quite a few Red Flowering Gums planted as street trees & they too are in flower. 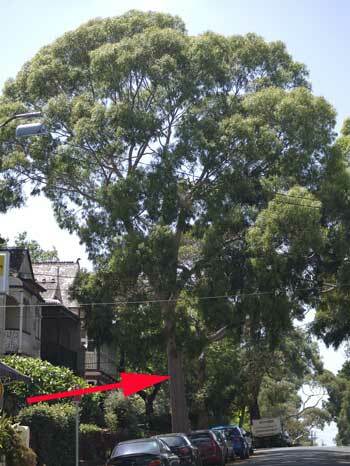 I am hoping that this species of tree will find itself all over Marrickville LGA. They are perfect for small growing street trees in tight spaces as they don’t grow a large trunk & can be pruned to grow upwards. 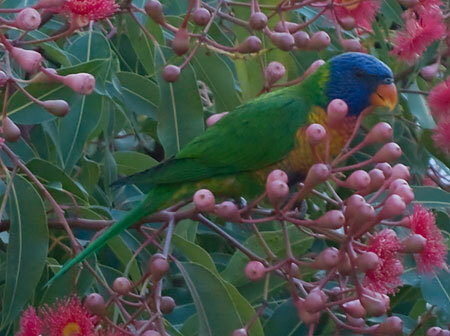 They are a great producer of food for urban wildlife & the Lorikeets love the nectar. 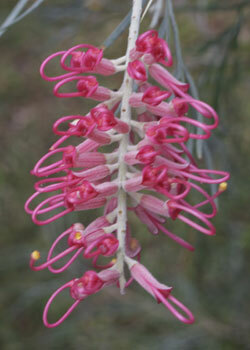 The flowering season for these trees lasts months as each tree puts out buds at different stages of growth so as one lot dies off, another is bursting into flower. Even the nuts they produce are good-looking. When the nut has completed it’s growing cycle & is dry, they can be snipped off the tree & soaked in perfumed oil. These can then be put in drawers or wardrobes to add a nice perfume to your clothes, to keep silverfish & moths at bay or in a bowl to add a perfume to the air. The nuts last for years & you can refresh them by adding a few drops of perfume whenever you like. If they get dusty, you can wash them & before adding more perfumed oil. This is a great idea for fetes.